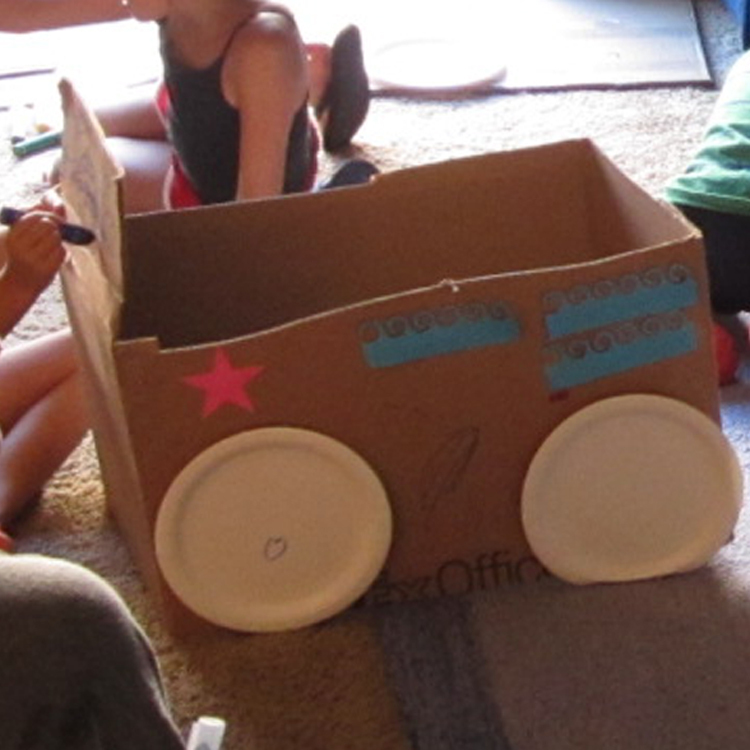 With the recent release of Cars 2, I thought it would be fun to have a play date for my Moms Club where the kids could get a refresher look at the first Cars movie, and get their craft on! 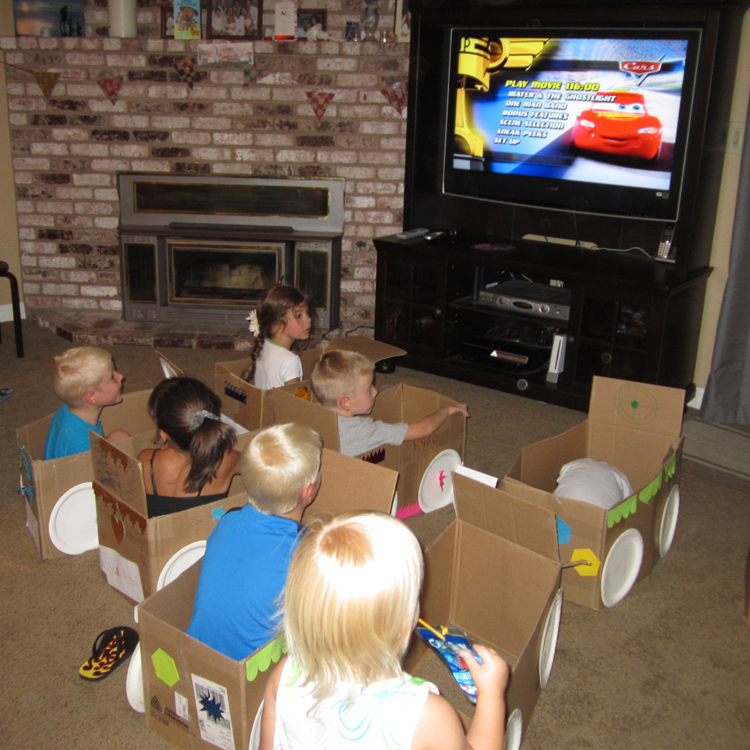 I set up a play date movie night where the kids could come and make their own car, then drive to the "Drive Ins" for the movie. It was (more than a little bit) chaotic, but also loads of fun! 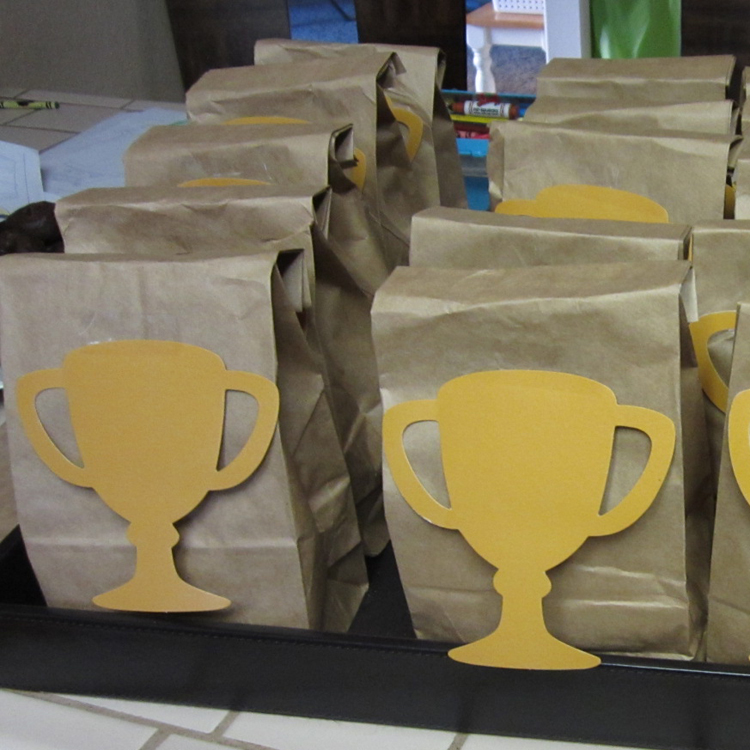 This was originally inspired by a Tip Junkie post about a Cardboard Box Birthday, so you could glam it up alot more for a party - I opted to keep it simple for our playgroup. 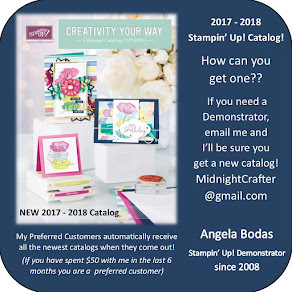 I work for a company that has plenty of boxes for free, you could save up your diaper boxes or ask around at local copy shops or appliance stores for boxes too. I collected a box for each child (roughly 18x24x18"), then I cut all the flaps off top and bottom except for one - for a windshield/dashboard. 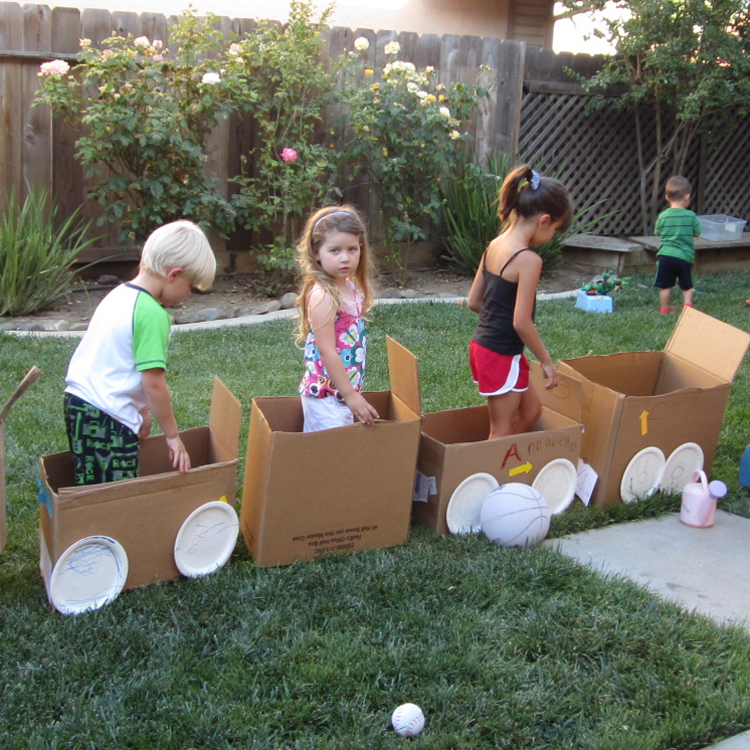 This makes the box light and maneuverable for the kids to pick up and "drive" around. At the dollar store I got paper plates (5 for each car - wheels, steering wheel or spare tire) and poster borders and accents, glue sticks and tape, and markers. Letter stickers, or yellow paper cut-out for lights, flame cut-outs would be awesome additions, and for a smaller group I would have added more decoration options, but we had 16 kids coming and a 3 hour window to do this in! As each family arrived, I handed out a box and showed them to Ramones House of Body Art where the plates and decorations were divided and prepared in packs for easy hand out. They could pick up a couple markers and a glue stick as well. The kids decorated the car as they liked - with Moms help, for the smaller ones. I printed off some license plate templates so each child could personalize their car. I allowed only 40 minutes for decorating, in the interest of time saving, but you could opt for longer - the kids loved adding on after they scoped out each others designs. After the cars were decorated, all the kids paraded around the yard while clean-up inside happened and the movie was set up. Then they all drove back inside to the Drive In to start the show. 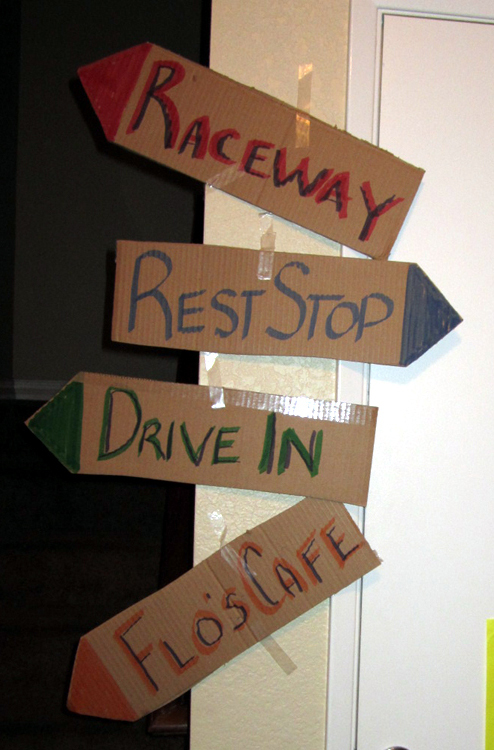 I used some of the cut off flaps from the boxes to make Directional signs. Leading to our door I used sidewalk chalk to draw a road, and posted some Route 66 signs and Cars pictures. For movie snacks I popped popcorn and bagged it with a trophy cut out decorating the bag, handed out as they "parked" at the Drive In. 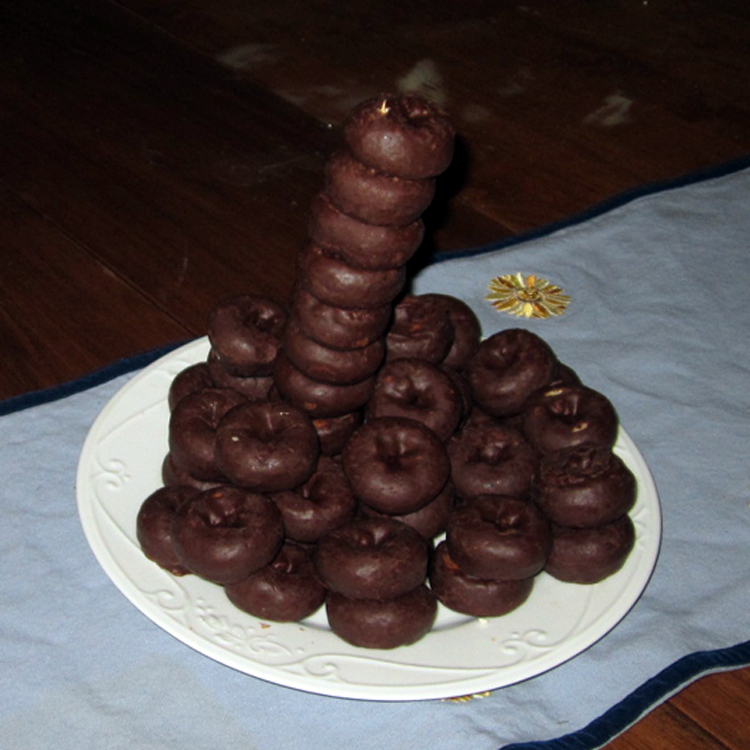 They could also grab (from Flo's Cafe) juice boxes or water, and licorice, chips, or some chocolate donuts I arranged to look like Luigis Leaning Tower of Tires. Decorations were simple and low key - it was a play date, but the kids LOVED it and it was really fun to put on! You could do this for any movie, everyone loves the Drive Ins! Thanks for stopping by, I hope you've enjoyed! OMG this is absolutely fab! You are a great mom! Glad you get to be home and enjoy this time with the kids. 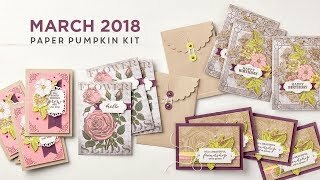 Great Grams (me) is sending this to daughter and grand daughter, just for fun for the Great Grankids. Just tooooo cute.